Bare Escentuals may be more well-known for their foundations than their skincare formulas but the brand are bringing a new range to high streets, salons and boutiques up and down the country. Our new, luxuriously rich cleanser deep cleans pores and lifts away impurities. Powered by our RareMinerals ActiveSoil Complex, this non-drying formula bursts into a rich lather when activated with water to clean and instantly refresh skin for a soft, smooth complexion. In our underground U.S. prelaunch of this product, customers called this a super cleanser and gave it stellar reviews. Powered by our RareMinerals ActiveSoil Complex, it removes makeup, dissolves impurities and rebalances skin for a soft, smooth complexion. Skin is left perfectly clean, instantly hydrated and renewed. It’s also gentle enough for eye makeup removal. This moisturiser effectively hydrates skin while improving firmness, elasticity, radiance and overall skin texture. Powered by our RareMinerals ActiveSoil Complex with its unique electrolyte delivery system, it’s formulated to perfectly moisturise combination skin. Specially formulated for dry skin, our new luxuriously rich cream deeply nurtures skin. Powered by our RareMinerals ActiveSoil Complex with its unique electrolyte delivery system, it’s formulated to provide the ultimate amount of moisture for dry skin. The result is soft, smooth and incredibly luminous skin. This dramatically effective treatment helps to restore firmness and reduces puffiness around the eyes. Powered by our RareMinerals ActiveSoil Complex, this formula delivers smoother, younger-looking skin around the eye area. This breakthrough night-time treatment is powered by our RareMinerals ActiveSoil Complex to replenish skin for smoother, brighter, more even skin tone with improved texture. Proven to visibly reduce pores, increase firmness and improve elasticity, this multi-tasing product reveals remarkably healthier-looking skin. Available in four tones – clear, light, medium and tan – to instantly diffuse imperfections. We know what you’re thinking… soil? Yes, that’s pretty much *exactly* what I’m thinking. Well, that and “biffidus boffidus digestivum”. The proprietry complex in our skincare line is extracted from effective, mineral-abundant soil containing a comprehensive blend of beneficial macro and micro minerals that exist in nature. When extracted through a unique method, these minerals yield a densely rich, efficacious concentrate capable of transformational skin-renewing benefits. “Unique method”, “Proprietry complex” – the whole blurb makes me desperate to read between the lines and actually UNDERSTAND what the hell it is. The vague information encourages almost mystical connotations, talking about infusions of energy and how the soil is powerful. 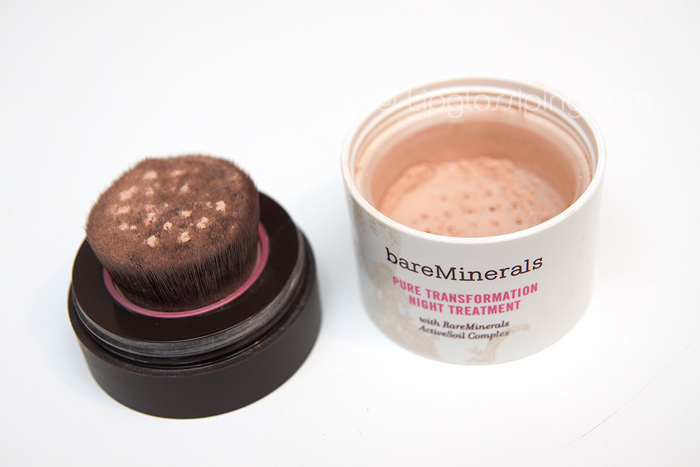 I understand that the marketing of this particular ‘rare’ mineral is hyped because the ‘ingredient’ is exclusive to the Bare Escentuals brand but blimey, please just explain HOW it benefits skin so amazingly? It’s high in antioxidants. Now, as a consumer, I understand (and appreciate) that snippet of information FAR more than being told that it’s a densely rich, efficacious concentrate capable of transformational skin-renewing benefits. Or maybe that’s just me. 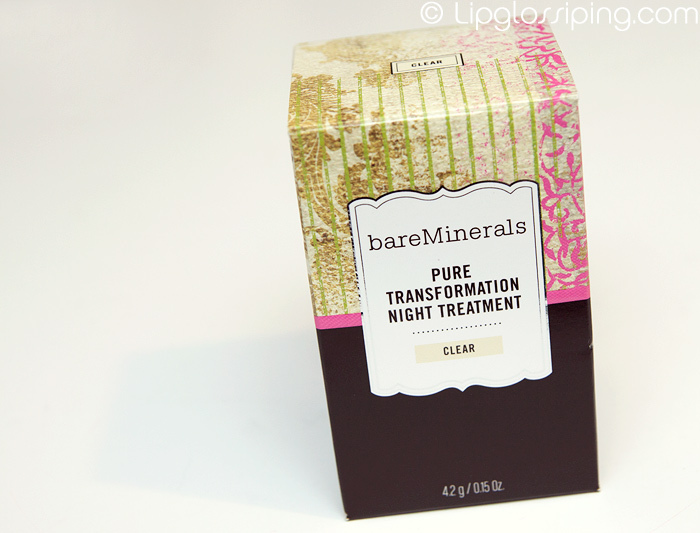 Now, back to the products – did you notice the BareMinerals Pure Transformation Night Treatment? I’m massively excited to trial it. In the simplest terms, it looks like a mineral foundation that you wear in bed. Makeup… in bed. I’m half horrified and half delighted! It’s supposed to make you look ah-maze whilst giving you visibly-reduced pores, increasing firmness and improving elasticity. Frankly, I’m just squealing about not scaring the bedbugs away. There’s a fine line between gimmick and revolution and I’m looking forward to finding out on which side of that line this product belongs. Got me some this morning and I’m the same as you, really intrigued to try but also a bit weirded out by the whole ‘makeup at night’ thing. Especially as they admitted at our preso that the only reason it’s tinted is for vanity reasons. I got the clear version though as I have no shame. I’m a slave to their foundation, so have high hopes. As a sidenote SoBe Botanicals does a Night Minerals powder which won’t scare the bejesus out of your partner. Actually keeping to the topic, I want ALL this stuff! Soil on my face? right you are! I’ve been using the Purifying cleanser for some months now and it’s fantastic! I’ve actually used bits and pieces from BE’s skincare and makeup range (shamefully, I have baskets upon baskets of the shadows and blushes) on and off for years. It’s a nice natural range with good ingredients. The old packaging for the night treatment was difficult to get the product to apply- I’m pleased they have seen the light and are using a brush. I can’t wait to see what you think of these! Will you be reviewing the whole range? I’m interested in trying some of the stuff, but I’m not sure what to start with. Anything that promises to clear out pores automatically gets my attention! And this night time foundation thing is JUST what I was looking for. Well, I say that as if I knew of its existence. What I mean is, I was just yesterday telling my brother (like he was even listening!) that my skin felt and looked raggedy, that I needed something to shrink the pores and increase the firmness. i want to try it so bad! dunno why people freak about soil on their face when we use clay and mud masks all of the time. what’s the difference? I think I’d be too scared to put that stuff on my face at overnight in case I had a mega- breakout! I just can’t get my head around it! The other stuff looks fantastic, and they don’t look too hideously priced. 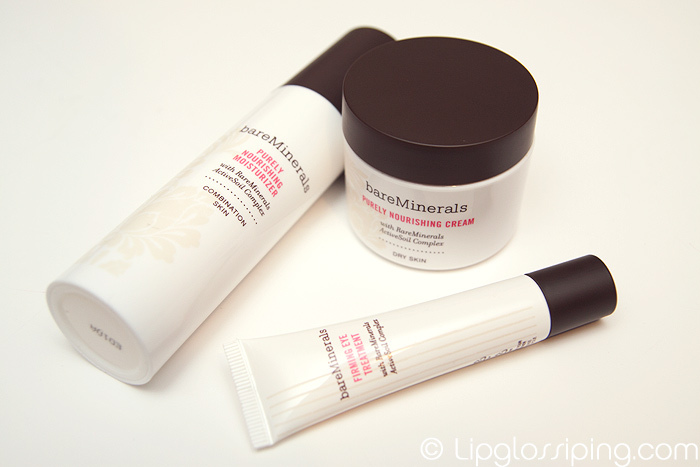 I have just come back from Canada where I tried the products and I would like to know where I can obtain bareMinerals products in Australia. I live in Adelaide, South Australia but am willing to buy online if necessary because I love this range.